When two atoms of the same kind are bonded through a single bond in a neutral molecule, then one half of the bond length is referred to as the covalent radius. This is unambiguous for molecules such as Cl2, the other halogens, and for other cases such as hydrogen, silicon, carbon (as diamond), sulphur, germanium, tin, and a few other cases. However for oxygen, O2, the situation is less clear as the order of the oxygen-oxygen bond is double. In this case, and indeed for most of the periodic table, it is necessary to infer the covalent radius from molecules containing O-O single bonds or from molecules containing a C-X bond in which the covalent radius of X is known. 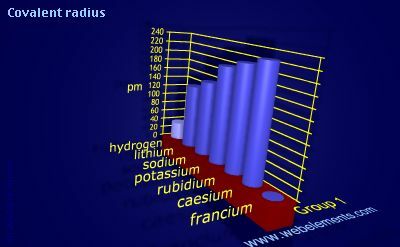 Image showing periodicity of covalent radius for group 1 chemical elements. The data for s- and p-block elements is broadly consistent across a number of sources but note that the values quoted for N (70 pm), O (66 pm), and F (60 pm) are sometimes less than those quoted here. Also the value for hydrogen is sometimes given as 30 pm. Soemtimes sources give the values for the Group 1 and Group 2 metals as larger than those given here. It may be necessary to treat the values for the d-block elements with some caution. Values are not often given in most sources. Select from the following links to see visual periodicity representations for atomic radii, covalent radii, and van der Waals radii. Ionic radii are also available. R.T. Sanderson in Chemical Periodicity, Reinhold, New York, USA, 1962. L.E. Sutton (ed.) in Table of interatomic distances and configuration in molecules and ions, Supplement 1956-1959, Special publication No. 18, Chemical Society, London, UK, 1965. W.W. Porterfield in Inorganic chemistry, a unified approach, Addison Wesley Publishing Co., Reading Massachusetts, USA, 1984. A.M. James and M.P. Lord in Macmillan's Chemical and Physical Data, Macmillan, London, UK, 1992.